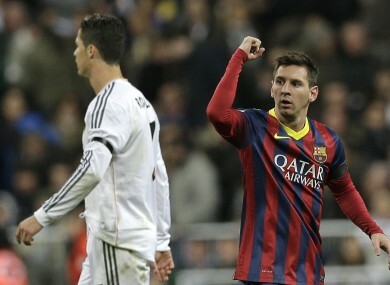 Ronaldo and Messi: hopefully neither of them do anything outrageous in the first 15 minutes tomorrow. IT IS ONE of the most anticipated matches in the football calendar — even more so with Luis Suarez expected to make his Barcelona debut. But Sky Sports are not allowed to show the first 15 minutes of el Clásico tomorrow because of a broadcasting rule that dates back to the 1960s. UK channels are subject to a “blackout” which prohibits them from showing any live football between 2.45pm and 5.15pm on a Saturday. As Real Madrid and Barcelona’s first clash of the season kicks off at 6pm local time (5pm UK), it falls foul of the archaic rule. So while Sky’s coverage begins at 5pm, the broadcasting giant will not be able to join live action from the Bernabeu until 5.15pm. Of course, in this day and age there are plenty of ways for you to circumvent the blackout and watch the first 15 minutes… not that we’d be encouraging you to do that sort of thing. How much longer can Arsenal tolerate treading water under Wenger’s management? Email “Blackout: Why Sky Sports can't show the first 15 minutes of tomorrow's Clásico”. Feedback on “Blackout: Why Sky Sports can't show the first 15 minutes of tomorrow's Clásico”.